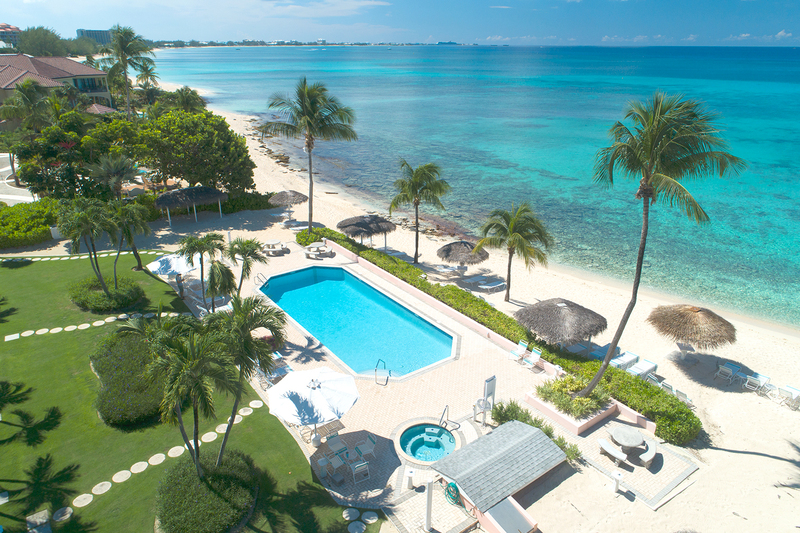 Aqua Bay Club Condos is the premier Grand Cayman resort on Seven Mile Beach. How did we earn that reputation? By being tirelessly committed to excellence in all we do, by always striving to be even better, and by offering the premier services and amenities that gained us our reputation. Here you will find every luxury, comfort, and modern convenience you need to make your vacation the most relaxing and enjoyable you’ve ever had. 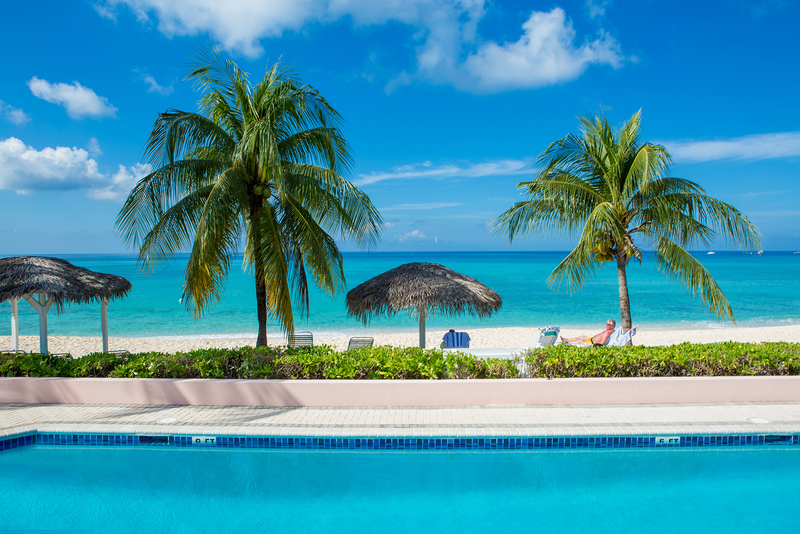 High-Speed Internet: High speed internet access is 100% free to Aqua Bay Club Condos guests. Every condo has its own high speed DSL internet connection and wireless router. There are no limits on usage, and connection instructions are provided in each unit. 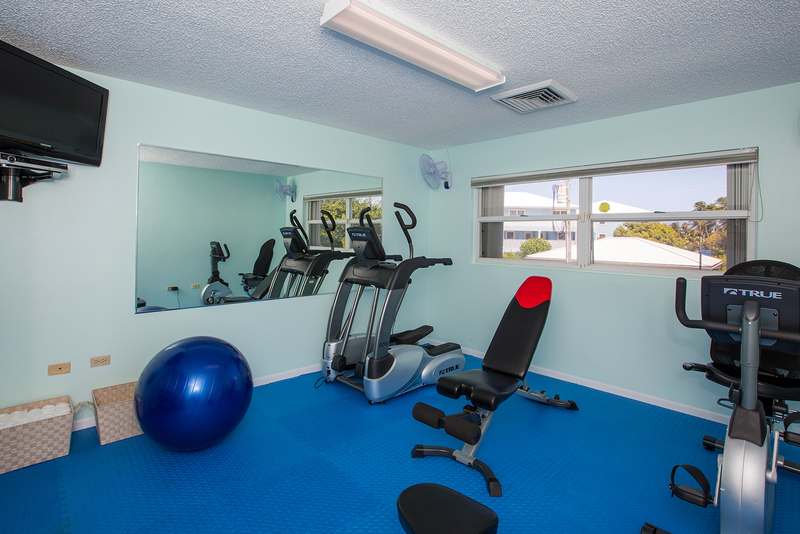 Fitness Center: Our new 192 square foot fitness center at Aqua Bay Club Condos is complimentary for all our guests and features state-of-the-art exercise equipment including a TRUE Fitness elliptical, TRUE Fitness recumbent bike, CAP barbell and dumbbells (5-50 lbs), NordicTrack stability ball, Rally Fitness incline/decline bench, Bowflex bench, yoga mats and more. Free Cell Phone: The resort offers cellular handsets for guest use, free of charge. Local and long distance calls can be made inexpensively using readily available cell phones with the prepaid island service. Your request can be made at time of booking to ensure availability at check-in. Book tours, make dinner reservations, arrange transportation, keep in touch, quickly and easily, anywhere you go on Grand Cayman Island. You will have your very own phone number for the duration of your stay. A deposit of $50 is required and will be reimbursed once the phone is returned. Pool and Jacuzzi: After a long day of diving, sightseeing or shopping, what could be better than grabbing a cool tropical beverage and kicking back in our spacious Jacuzzi to watch the sunset? When it’s time for dinner, hop out and rinse off under the conveniently located fresh-water showers. For a change of pace, settle in for a lazy day on a comfy deck chair by the spectacularly situated ocean front swimming pool. 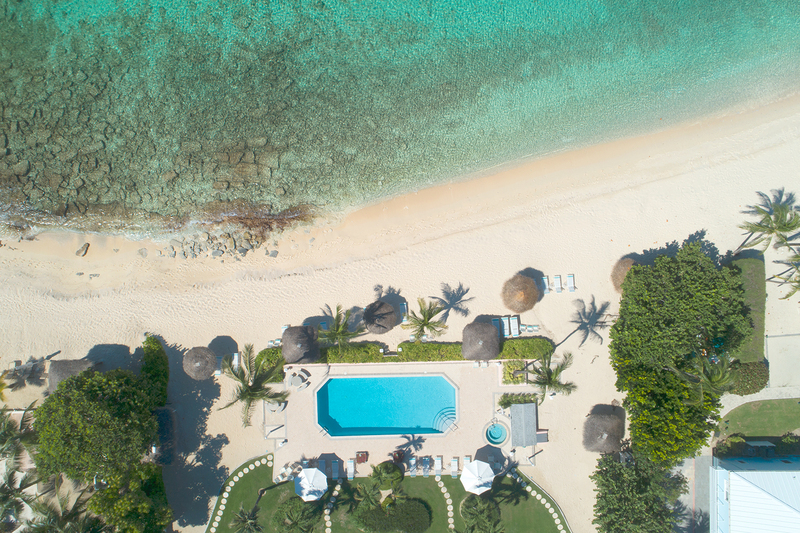 Beachfront: Just steps from your front door lies the award-winning Seven Mile Beach, just as you imagined it: white sands, clear blue ocean, and palm trees. Enjoy a relaxing siesta or immerse yourself in a good book in one of our cozy hammocks under a thatched Palapa hut. 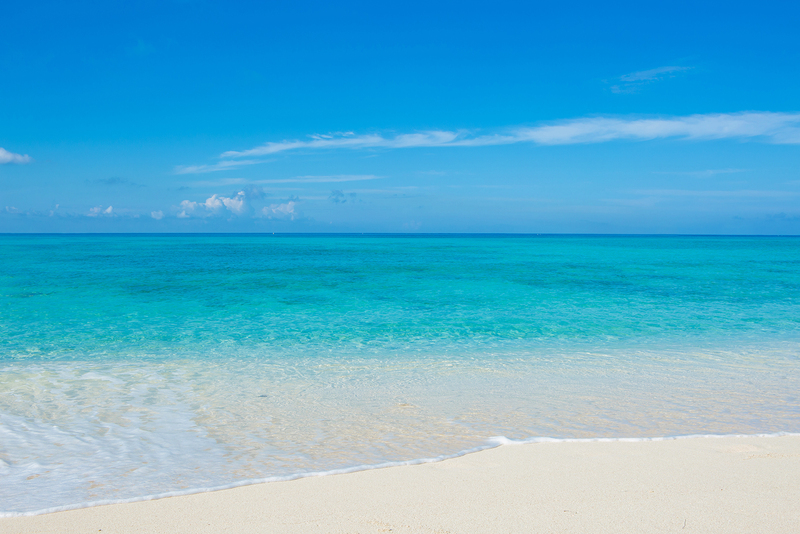 Snorkel at the water’s edge or stretch out on a lounge chair in the sand. We provide you with beach umbrellas and towels for your convenience and comfort. Go exploring. There are restaurants, bars, dive shops and water sports rentals along this stretch of the beach. 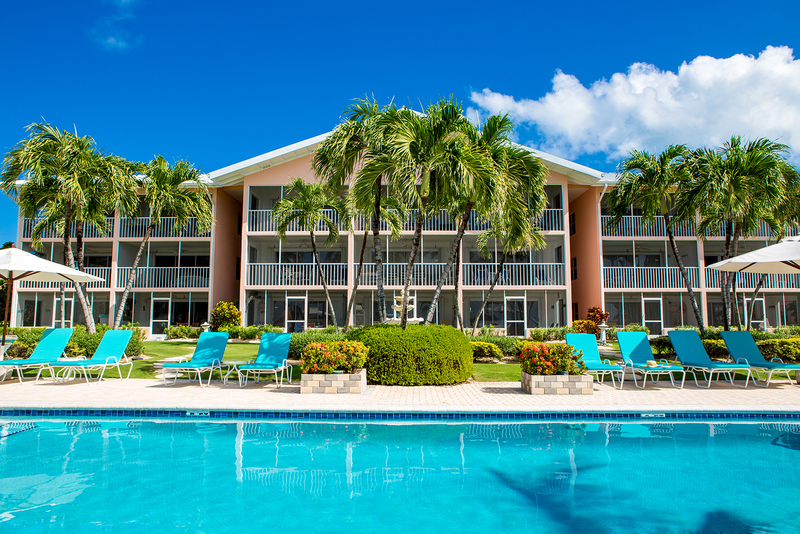 Your condo on Seven Mile Beach has so much to offer! BBQ Grill: Feel like eating in? Well, relatively speaking. Guests often make use of our two Weber gas grills on the beach under the sea grape tree. Cook a family meal or dine with new friends. Grilling on the beach is a great way to socialize, and you definitely can’t beat the view! 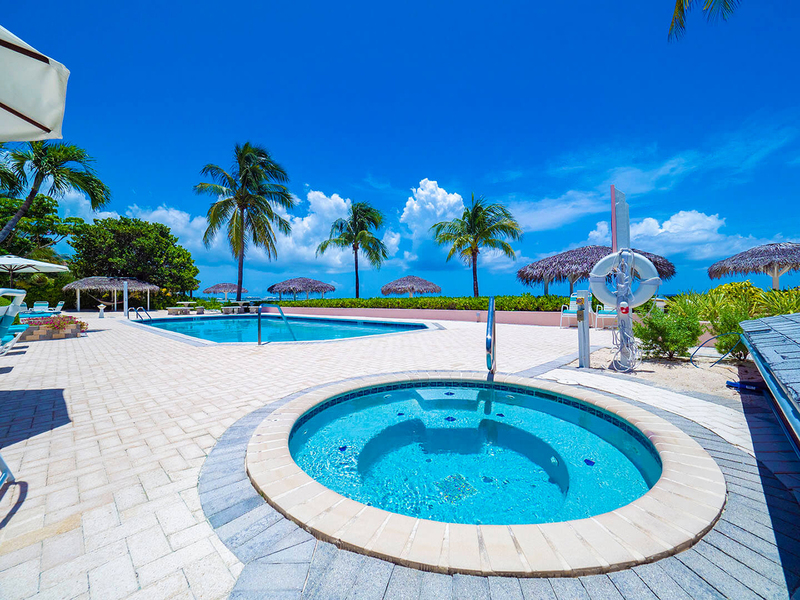 Keep Cool: Central air-conditioning and ceiling fans are available in all Aqua Bay Club Condos, just in case you feel like a temporary respite from the tropical weather. Housekeeping: Maid service and laundry facilities are provided. Please note that housekeeping services are not provided on Sundays or most public holidays. Business Services: Do you need to send or receive priority documents? Maybe there are some documents you need to sign and send in a hurry? You are in luck! 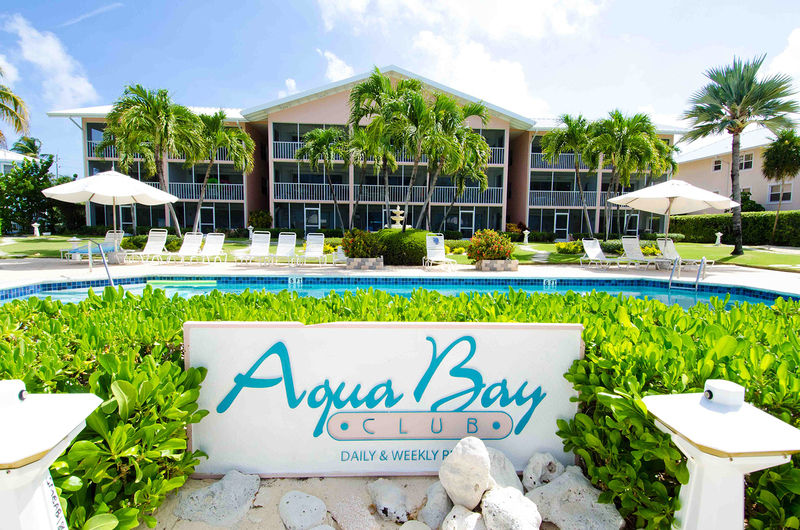 Aqua Bay Club Condos offers printing, fax and copy services to all our guests. 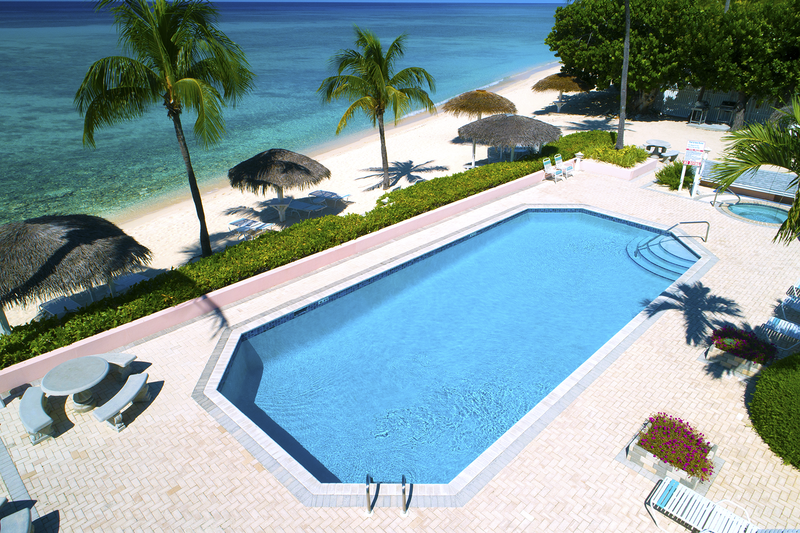 Your stay at our Grand Cayman resort will not hinder your work flow. Elevators (Not Available): Please note that elevators are not available at Aqua Bay Club. While stairs provide easy access to our 2nd and 3rd floor condos, please inform us if you have any mobility issues prior to booking so we can ensure that suitable accommodations are available. Up to 6 guests can be accommodated in each condo (with additional fees applying for guests 5 and 6). Kids under three (3) stay free. There are four roll-away beds on the property. There are also four pack-and-plays for guests traveling with infants. These are provided to guests on a first come, first served basis. Babysitting services are available through the Best Home Care Agency. Contact the agency to arrange this service. Check-in is from 3:00 PM to 5:00 PM, Monday to Saturday. Check-out is at 11:00 AM. Additional charges may apply for late check-out. After-hours check-in is available with advance notice. Every condo is equipped with a hair dryer. Many condos do not have DVD players and they are not available upon request. Safes are provided in each condo. Cribs and high chairs are available as a complimentary special request item through the front desk. The number of cribs available is limited and will be provided on a first come, first served basis. Two keys are provided upon check-in. In the event you lose your keys, please contact the front desk immediately. There will be a charge for lost keys. All keys are to be returned to the front desk upon check-out. If the office is closed, please use the KEY DROP BOX outside to the right of the office door to return the keys. Please contact the front desk for any items that you have lost or found. Mail and packages received at the property may be collected by either calling or stopping by the front desk during office hours. Postage is available at current rates at the front desk. A parking space is available at each condo. Please limit vehicles to one per condo. Aqua Bay Club will not be responsible for items left in vehicles on the property. Local calls can be made free of charge. Direct long distance calls are not permitted. However, credit card and collect calls may be made by dialing the International Operator: 010. Cell phones based on availability can be requested at the office and you can put credit on these phones at the grocery stores or gas stations.